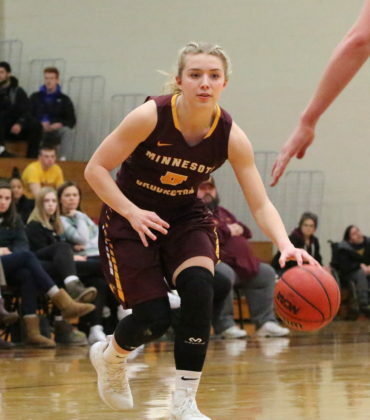 The University of Minnesota Crookston (UMC) Golden Eagles Women’s basketball team lost its sixth straight game falling to Concordia-St. Paul 67-59 in an NSIC game played at Lysaker Gymnasium in Crookston. Minnesota Crookston got off to a quick start with Paige Cornale (Fr., Oak Creek, WI) making a free-throw followed by back-to-back baskets from Isieoma Odor (Sr., Bloomington) giving the Golden Eagles a 5-0 lead. Following a Concordia-St. Paul lay-up, Odor scored four straight points pushing UMC ahead 9-2. A five-point streak from Paige Weakley (Jr., Kearney, MO) pushed the host’s lead to 14-5, but the Golden Bears closed the first quarter on a 5-0 run to close out the quarter down 14-10. 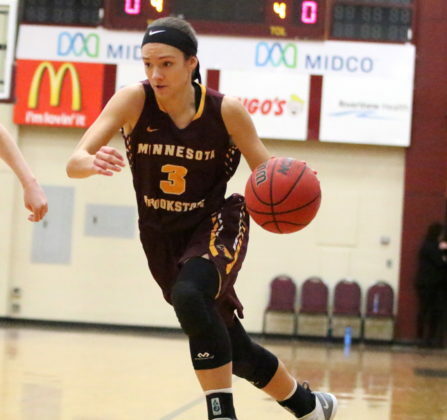 UMC opened the second half with lay-ups from Cornale and Fox to take a 33-27 advantage. CSP scored six straight points tying the game at 33-33. Minnesota Crookston countered with a 7-0 run to gain a 40-33 lead. 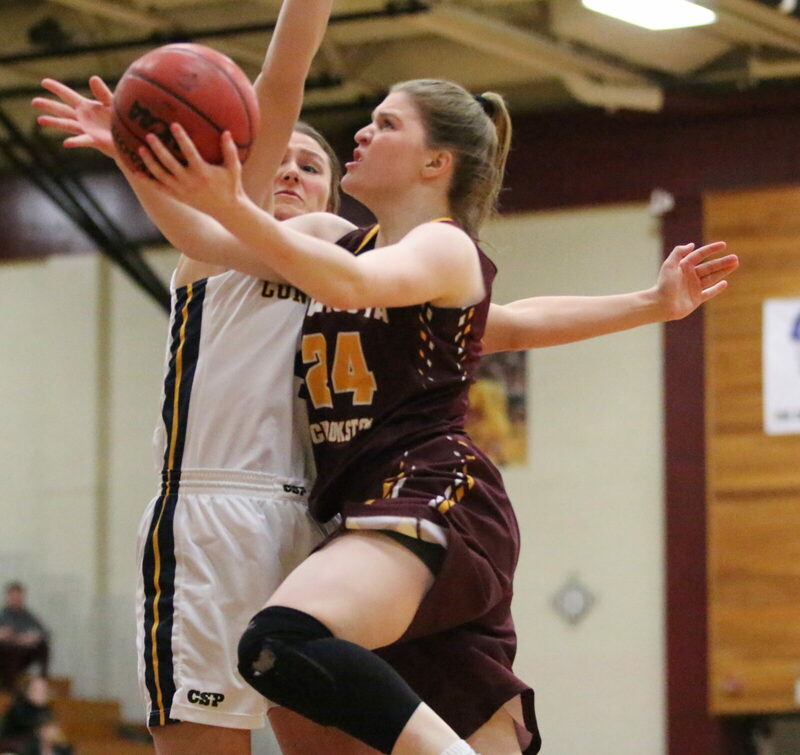 The Golden Bears scored a pair of free throws followed by a lay-up to pull within three and a jump shot just before the end of the quarter cut the visitor’s deficit down to 43-41 to end the third quarter. 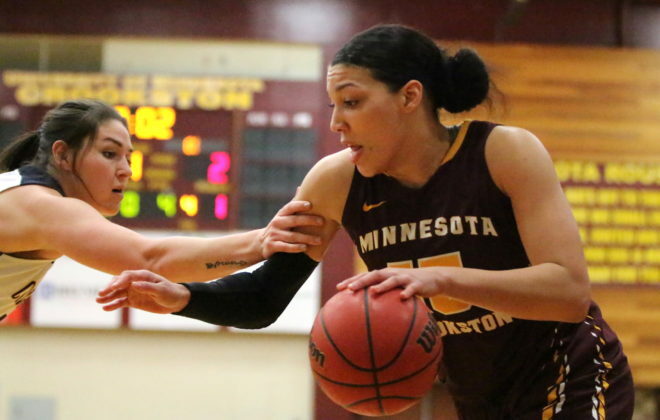 Minnesota Crookston falls to 10-14 overall and 5-13 in the NSIC. The Golden Eagles return to the court on Friday when UMC hosts Minot State at 5:30 p.m. on KROX. Concordia-St. Paul improves to 17-6 overall and 13-5 in conference play.